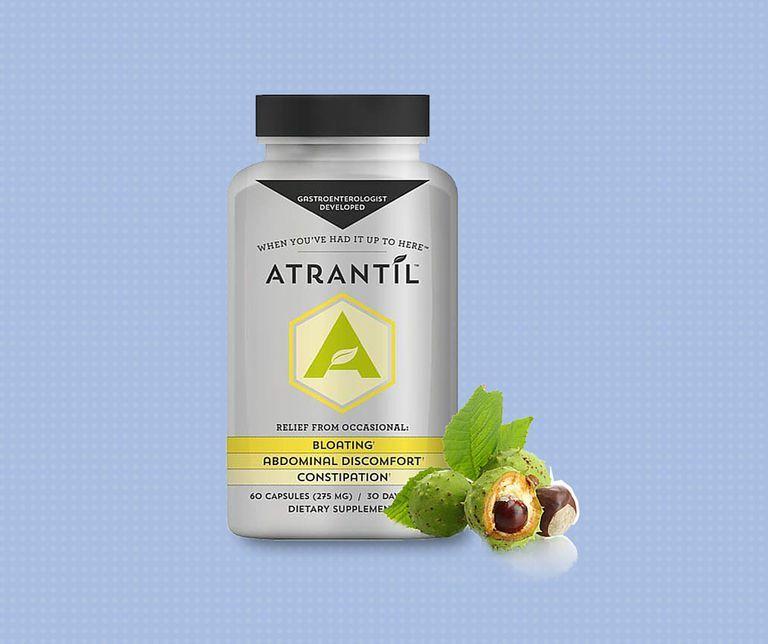 Atrantil is a supplement designed to ease the symptoms of constipation-predominant irritable bowel syndrome (IBS-C), particularly gas and bloating. It was developed by a gastroenterologist named Kenneth Brown, M.D. Atrantil is a blend of three extracts - Quebracho, Conker Tree (horse chestnut), and M. balsamea Willd (peppermint) - all chosen for their effects within the digestive tract. The rationale behind the development of Atrantil was to come up with a natural supplement that eradicates small intestinal bacterial overgrowth (SIBO). The expectation is that the actions of the extracts in Atrantil will have a deleterious effect on gas-producing bacteria found in the small intestine. Such bacteria produce both hydrogen and methane. Methane has been associated with constipation. Atrantil is theorized to reduce the number of methane-producing bacteria, thus improving constipation, along with gas and bloating. 1. Quebracho extract contains tannins, a type of flavonoid, best known for their presence in wine. When tannins are added to the diet of cows, there is a reduction in how much methane gas they give off. 2. Conker Tree extract contains saponins (which you may have heard of because they cause the bitter taste in quinoa, and so must be rinsed off before cooking.) Saponins are theorized to have antibiotic qualities, to increase the speed of intestinal contractions and to also reduce the production of methane. 3. M. balsamea Willd extract contains peppermint oil, an oil that has strong research support for easing abdominal pain. As of this writing, there is only one published study, authored by Dr. Brown, in a not-so-mainstream journal. It was a small pilot study, in which 16 IBS-C patients were given either Atrantil or a placebo for a two-week period. Results indicated that those patients who were given the supplement experienced "significant improvement" in constipation and bloating. No side effects were reported. However, we can only take these results with a grain of salt. In order to have any solid evidence for the safety and effectiveness of this product, there must be larger studies, of longer duration, and conducted by more objective and independent researchers. According to the manufacturer's website, you can take two capsules at a time, up to three times a day. It is recommended to take the supplement one hour before eating, unless you have a history of heartburn. In the small study, no side effects were reported. The website discusses a possibility of some "die-off" effects, resulting from the eradication of intestinal bacteria. The website describes such die-off as including fatigue, achiness and/or low-grade fever. Again, without some solid research studies, we don't know if these symptoms are actually the result of the product. As you can see there is not much is known about Atrantil's effectiveness. Although I couldn't find any evidence of any major health risks associated with any of its ingredients, there is not enough evidence to make any claims in terms of safety in general, or in terms of any interactions with other medications. If you are still interested in trying Atrantil, you should discuss the issue with your physician (as you should for any over-the-counter supplement.) If you are pregnant or breastfeeding, it would be best to avoid taking this supplement due to lack of safety information. What if you have IBS-D? The researchers theorize that IBS-D patients could benefit from the anti-gas properties of the tannins in Quebacho and the anti-pain benefit of M. balsamea Willd, but acknowledge that it is unknown what effect the saponins of Conker Tree would have on diarrhea symptoms. The only conclusion that can be drawn now about Atrantil is that further research needs to be conducted to provide some hard evidence regarding the safety and efficacy of its formulation. The notion of an effective alternative to the use of antibiotics for SIBO and IBS is certainly appealing, we just don't yet know if this one will fit the bill. "Atrantil website" Accessed October 27, 2015. Brown, K., Scott-Hoy, B. & Jennings, L. "Efficacy of a Quebracho, Conker Tree, and M. balsamea Willd Blended Extract in a Randomized Study in Patients with Irritable Bowel Syndrome with Constipation" Journal of Gastroenterology and Hepatology Research 4:1762-1767.